John Marquis believes Luton Town will provide the first true test of the season of Doncaster Rovers’ promotion credentials this afternoon. 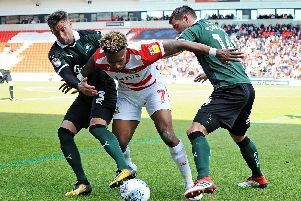 Rovers have made an impressive start to life in League Two and currently sit second in the table after a run of five wins from their last six league matches. But Marquis says today’s game at Kenilworth Road against a promotion rival will show where Rovers truly rank in the pecking order. “This is probably the first test where we can look and say it will be a good gauge of where we are,” the striker told The Star. “It’s our first real test of the season in terms of probable contenders who are in and around it. “We’ve got three big games coming up in a week, with Carlisle and Portsmouth coming up, and we need to make sure we come out with a good points return that will set us up moving forward. “Luton is up first and our ambition is to go there to get three points. Hosts Luton are three points behind Rovers after eight games with their decent start stuttered by back-to-back defeats to Crawley Town and Grimsby Town. Marquis is expecting a hostile environment at Kenilworth Road and while he admires Luton, he believes Rovers will have the edge. He said: “They’ve got good players. The manager plays good football. “I’ve played there before and it’s a funny little ground, quite hostile and the fans come out in numbers. “It’s going to be a good game between two good footballing sides. “It may come down to that bit of extra quality or who fancies it more on the day. “If it comes down to hard work and determination, I’d fancy us over anyone. “And on the quality, I feel we’ve got more match-winners in the team than them.